check out "how we got to now" on youtube. Think for a moment about some of the pioneering developments from the earliest days of American aviation: The first pilot’s licence; the first flight from one city to another; the first airplane sold commercially. More than a century later, most people attribute these milestones to the Wright brothers. But the Wright brothers were responsible for none of these firsts. In fact, all of these achievements belong to just one man: Glenn Hammond Curtiss, the father of modern aviation. So why is it that most Americans have never heard his name? Twitter, Facebook, Youtube. The past year has brought a backlash against these companies and others over data privacy and their treatment of speech. Tech visionary and critic Jaron Lanier discusses his take on social media and why he thinks you should delete yours. Read Jaron’s latest book: Ten Arguments for Deleting Your Social Media Right Now. Glamour. Hollywood. Drama. Although she was known as “the most beautiful woman in the world,” Actress Hedy Lamarr’s greatest life work was far from the silver screen. At the height of her film career, and in the midst of a world war, Hedy invented the basis for all modern wireless communications: signal hopping. Part of a special series with Smithsonian Magazine highlighting the lives of women inventors to celebrate Women’s History Month. Head over to Smithsonian.com/Wondery to go deeper, or find us on Twitter @InnovationsPod. Stitcher - You can find episodes of American Innovations, completely ad-free, only on Stitcher Premium. For a free month, go to stitcherpremium.com/wondery and use promo code “WONDERY”. A machine to mass produce paper bags. Seems unremarkable today, but in the 1800s, it was cutting edge. The technology would change everyday life, and maybe, the life of one inventor: Margaret Knight. That is if she could get people to believe she invented it. The Art of Shaving - Go to theartofshaving.com and enter promo code AI at checkout to get 15% off your first order! The first self-made female African American millionaire is how she’s known. But Madam C.J. Walker’s story is much more than a rags to riches tale of a cosmetics industry mogul. She was an inventor, an entrepreneur, and a philanthropist. Along the way, she faced challenges from inside her own community and found a way to transform them into successes. Astronauts Neil Armstrong and Buzz Aldrin are preparing to land on the Moon. The whole world is watching live on television. But something is very wrong, their warning alarms are flashing and they don't know what it is. There’s only one woman who can fix it: MIT software engineer Margaret Hamilton. This is the first episode of a special series with Smithsonian Magazine highlighting the lives of women inventors to celebrate Women’s History Month. 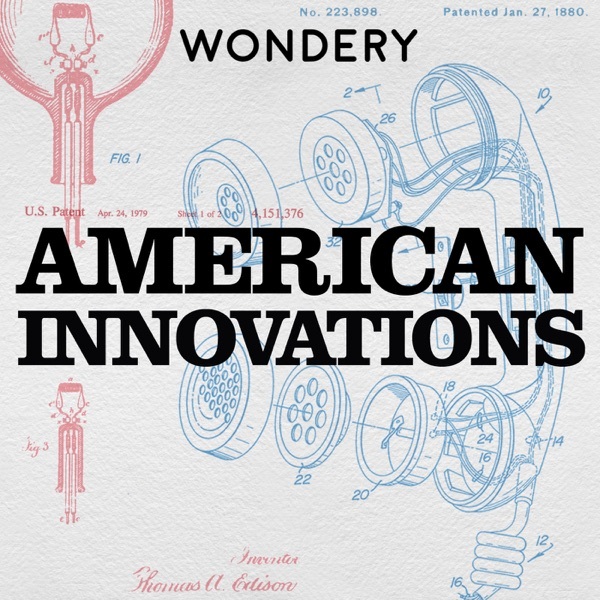 Head over to Smithsonian.com/Wondery to go deeper, or find us on Twitter @InnovationsPod. Things are really picking up for Coca-Cola, thanks to its industrious new—and most importantly, sober—owner, Asa Candler. Over the past year, Candler’s sold enough syrup to make half a million glasses of soda. The drink is loved by everyone who tries it, but on the business side, Candler is still just scraping by. To turn Coca-Cola into the sensation he knows it can be, he will have to battle a slew of imposters, take a massive marketing risk, and deal with one very problematic ingredient: cocaine. In the wake of the Civil War, Atlanta emerged as both the cultural capital of the New South, and the epicenter of its snake oil trade. A shell-shocked populace, haunted by poverty, hunger and disease sought salvation in the dubious cure-all tonics of the pharmacy trade. What they got instead would go on to become the most famous beverage in the world: Coca-Cola. Horace Day made a fortune off of the vulcanizing process Goodyear repeatedly went broke trying to develop. Now, with the help of the most famous attorney in the country, Secretary of State, Daniel Webster, Goodyear plans to make Day pay. In 1839, Charles Goodyear accidentally discovered the key to rubber. Sulfur alone had proved too fragile, but when he combined it with heat? Durable, stable rubber. Finally Goodyear’s dreams were within his grasp. But that’s when he caught the eye of a New Jersey merchant named Horace Day, and things took a turn for the worse. Bill Nye tell us how he became “The Science Guy,” why climate change is solvable, and what he thinks is the most important innovation of all time. He’ll talk his new Netflix show, “Bill Nye Saves the World” — which pretty much sums up what he’s trying to do these days. Plus, he shares his memories of Carl Sagan and how to combat today’s anti-science movement. VR is dead. Then along comes a teenager with a vision and a headset and changes everything. The Great Courses - Go to TheGreatCoursesPlus.com/AI for a special FREE MONTH TRIAL to The Great Courses Plus. Atari has assembled the best of the best. They look ready to get VR off the ground but then the company they make a colossal mistake. The mistake’s name is E.T. An interview with Josh Clark, co-host of the “Stuff You Should Know” podcast. Josh has a new show called “The End of the World with Josh Clark” that looks at those big existential questions we humans can’t seem to settle: Are we alone in the universe? Where did we come from? And, what’s next for us? The Great Courses - Go to TheGreatCoursesPlus.com/AI for a special FREE TRIAL to The Great Courses Plus. As Horace Wells’ life went from bad to worse, William Morton was handed a golden opportunity. At stake was scientific pride and a lot of money. But who will triumph? After experimenting on himself, Horace Wells realized that laughing gas might help make surgeries less painful. But his search for a business partner would lead him to a fateful encounter with a petty crook named William Morton. For decades, Americans resigned themselves to gritting their teeth through the agony of surgery. And then along came an eminent surgeon, a charming swindler and his hapless mark and changed everything. The polio vaccine may have wiped out the disease in the United States, but the struggle to eradicate it continues around the world. Dr. Rosamund Lewis is an expert in immunization and helps lead the World Health Organization’s initiative for polio eradication. In 1955, the world received its first viable polio vaccine, courtesy of Jonas Salk. He was hailed as a hero until kids started to fall sick with polio. A bad batch of vaccines was thought to be to blame. But the panic But it was also an opening for a scientist with a competing vision. Albert Sabin warned of the dangers of Salk’s vaccine from the start. The final clash between the two vaccines, and the two scientists, is the true story of how polio was conquered. Pressure mounts and so does the realization that the fight against polio will be a risky one with enormous consequences for failure. Vaccines contain benign samples of the viruses they’re designed to protect against. If a flawed polio vaccine is tested on humans, many could get sick. American Innovations is presented by ZipRecruiter. Try it for free by visitingZipRecruiter.com/AI. American Innovations is presented by ZipRecruiter. Try it for free by visiting ZipRecruiter.com/AI. Can a computer pass for human? And more importantly, can a computer beat a human at Jeopardy? It’s all fun and games until we start putting life-changing decisions in the hands of machines. A leap in the power of machine learning and artificial intelligence causes concern about the dangers ahead. The development of smartphone Artificial Intelligence from early government research funding and the first experimental robot in Silicon Valley to the rise of the personal assistant known as Siri. With six different kinds of pieces, 64 squares to move in, and billions of possible combinations of moves, chess is a good test for a computer. The number of distinct 40-move games is far greater than the number of electrons in the visible universe. For all intents and purposes: almost infinite. Gary Kasparov is the world’s best chess player. Deep Blue is a computer. It’s humanity v machine. There’s a lot at stake and things turn controversial fast with accusations of cheating, a very human meltdown and a computer that hallucinates. Artificial Intelligence is no longer the stuff of science fiction. And it’s about to get much more powerful: machines that can reason, create, predict the future, even dream. AI is likely to be one of the most transformative technologies of the 21st-century. This is the first in our four-episode series about the rise of artificial intelligence and humanity's quest to breathe intellectual life into computers. In this episode, we're going to meet the mavericks who first dreamed of a world where machines capable of being smarter than the people who created them. And what better way for smart machines and their creators to face off in a battle of wits -- than by playing chess? Pre-order Steven Johnson’s new book Farsighted now before it is released on September 4th. Today is the last episode in our interview series on the future. Next week, we’ll be back with a new narrative arc on the fascinating history of artificial intelligence. But before we get to A.I. and the future that IT holds, what is the key to looking ahead? We’re obviously very interested in the future here at American Innovations. So far, we’ve talked about the growing crisis facing our planet’s freshwater, to the pursuit of immortality, to the revolution that the blockchain and digital currencies might bring. But what about the art of predicting the future itself? That’s the question we’re gonna be exploring today with futurist Jane McGonigal. You’ve probably heard a lot about Bitcoin by now. Cryptocurrencies are shaking up the global finance industry. Some even say this form of commerce will be more disruptive than the creation of the internet itself. To understand this revolution, you have to get outside the idea that cryptocurrencies like Bitcoin are just new forms of currency. So today’s episode ISN’T on Bitcoin. Today, we’re talking with Erin Griffith about the underlying platform that allows Bitcoin to thrive: the blockchain. For nearly two decades, Dr. Joon Yun has been chasing the idea of curing the most pressing disease of our time: old age. In our arc on the history of DNA science, we looked at how the mapping of the human genome and new advances like CRISPR gene editing might transform health care and extend average life expectancies. But what if that’s only the beginning? Could science potentially find a cure...for death itself? We’ve spent a lot of time traveling through history on this show, from Gregor Mendel and the early days of genetic research to the Manhattan Projects and the race to unlock the secrets of the atom. But what about the ideas, inventions, and advances of OUR time? Today’s innovations are rapidly changing everything around us and will continue to transform the centuries ahead. What will the world of tomorrow look like? That’s the question we’re going to be asking over the next few episodes. Welcome...to the future. On this episode, we're speaking with Florencia Ramirez of eatlesswater.com. Nuclear Energy is a story that’s included a cursed plutonium core, runaway reactors, a magic neutron wand and Charlie Chaplin. We've also heard about the missteps. Fake nuclear fusion plants and some overoptimistic claims about cold fusion. In this episode, we're talking to someone who actually helped investigate that last claim. James Mahaffee, an author, nuclear science historian, and a senior research scientist at the Georgia Tech Research Institute. This series has taken us from Albert Einstein in the Swiss Patent office to the bombing of Japan, from the monster movies of the 1960s to nuclear meltdown at Three Mile Island. Nuclear energy fell rapidly out of fashion, and to many it seemed like the atomic age is coming to a close. Except maybe it’s not. Because right now there are multi-billion dollar projects underway to turn atoms into energy again - this time through the power of nuclear fusion. Welcome to your future. The first serious accident from a nuclear reactor happened in the United States in 1960. It wouldn't be the last. And in the coming decades, a new word will be used to talk about accidents of these kind, a word that will strike fear into the hearts of people living near nuclear power plants from Russia to Japan to the United States: meltdown. The Second World War energized research on atomic science and the United States was at the forefront. For one, it had the scientists. Second, the US government was willing to back the research. Third, we wanted the bombs. However darkly depressing this seems it’s true. Our history of nuclear power is intertwined with the history of nuclear weapons. American Innovations is presented by ZipRecruiter. You can try it for FREE at ZipRecruiter.com/AI. In 1958, President Dwight Eisenhower went on national television introducing a new kind of power plant, one that will transform the world. Nuclear energy and the Atomic Age took America by storm, but this misunderstood technology’s potential has always been in question. Last series we looked at the building blocks of life, DNA. This time we’re turning to atoms, and specifically to the energy that comes from splitting atoms. We’ll take you to one of the most powerful and controversial energy sources on earth: nuclear energy. To wrap up The Dynamo of DNA, we're talking to Britt Wray. You can follow her on Twitter, and visit her website for more. You can also pick up her book, Necrofauna: The Science, Ethics, and Risks of De-Extinction to learn more about De-Extinction. We’ll be back next week with an all new arc on nuclear energy. Wix - Launch a professional-looking website in no time for your innovative ideas with total design freedom, industry-leading SEO, and advanced code capabilities at Wix.com. Audible - Start your free trial and download a free audiobook by going to Audible.com/AI or text AI to 500-500. The human genome project finally allowed us to read the “Book of Life,” the genetic code of living things. But now there’s a tool - CRISPR - that will allow us to rewrite it. With CRISPR, we can change the color of flowers, eliminate diseases, and even… bring back Wooly Mammoths. We hope you enjoyed our first series, The Dynamo of DNA. Join us next week for a conversation with scientist, broadcaster and author Britt Wray. Over the past 50 years, our understanding of DNA has grown exponentially. It took supercomputers working overtime to produce a single genomic map… and now all it takes is a spit sample that you drop in the mail. For about a hundred bucks, you can have your own personal genome mapped. One thing we still haven’t figured out is what to DO with all of that information. It’s been used to map family trees, trace diseases, exonerate innocents and catch serial killers - and that’s only the beginning. The path to understand genetics was rife squabbles and competition among scientists vying to discover genes, chromosomes, and the structure of DNA. The tussles had been going on for a century. But the 1980s introduced an even bigger grudge match: who’d be the first to map the entire human genetic code? This race would get downright nasty before it was done. Along the way there would be a lot of good science. But the science often took a back seat, as politics, money, and egos all got in the way. The leaps of mankind, as they happened.